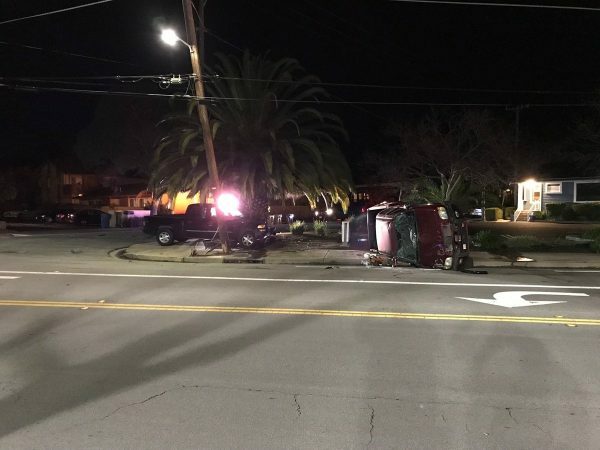 A man driving a pickup truck fled after colliding with another pickup in San Luis Obispo Sunday evening, causing the second truck to roll over, as well as a power pole to become jarred loose. At about 8 p.m., callers reported the crash occurred near the intersection of Broad and High streets, according to the San Luis Obispo Police Department. Following the collision, a red pickup was lying on its side on the sidewalk with its windshield cracked, a photo posted online by Police Chief Deanna Cantrell shows. A nearby power pole was damaged and standing up at an angle, yet power lines did not appear to fall down. KSBY reports an initial investigation indicated a black pickup truck was heading east on High Street and slammed into the red pickup after failing to stop when it did not have the right of way. The suspect’s vehicle is registered in the Central Valley. Police describe the suspect as a white man with a shaved head who was wearing dark clothing. He was last seen walking south toward Santa Barbara Street.